On 6th-7th August, Survation polled 1,010 people in Scotland aged 16+ on behalf of the Scottish Daily Mail. We asked how they would vote in the independence referendum, and their views on the debate between Alex Salmond and Alistair Darling. This is the highest ‘No’ vote – and the biggest lead over ‘Yes’ – seen in a Survation poll since our first independence referendum poll in February. 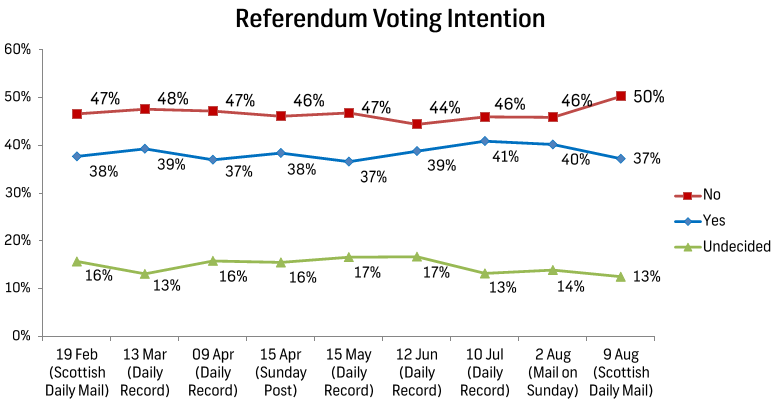 The charts below show the results for all Survation independence referendum voting intention questions since February. The Scottish public were clearly not impressed with Salmond in the debate: the adjectives most used to describe his performance were ‘Weak’ (18%), ‘Uninformed’ (13%), and ‘Dishonest’ (11%). However, nearly two-thirds of those who watched the debate said it would not affect the way they would vote. 45% said that the choice of currency would be ‘very important’ to them in the event of Scottish independence, with half wanting to continue to use the pound in a currency union with the UK, were Scotland to become independent. 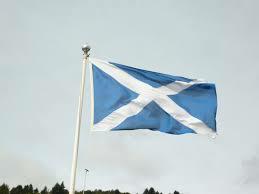 There is also a clear demand (69%) for the Scottish government to draw up a ‘plan B’ if a currency union is not agreed to, although 40% think that the Westminster parties are bluffing when they say such a union will not happen.